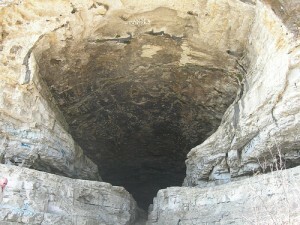 Interior of Cave-In-Rock. Photo by Jimmy Emerson. When you think of Southern Illinois, the word "pirate" doesn't usually come to mind. Pirates? In Illinois? That’s right! The namesake attraction of Cave-In-Rock State Park, located on the Ohio River shore in Southern Illinois, has a notorious history of river piracy! In the late 1700s and early 1800s the Mason Gang used Cave-In-Rock, a large cave on the bank of the Ohio River, as a place to lure unsuspecting river travelers so that they could rob and kill them. 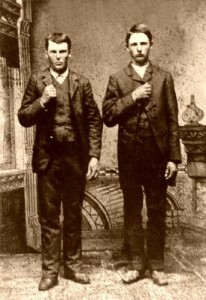 The cave also harbored a pair of notorious killers, the Harpe Brothers, who fled execution in Kentucky and used the cave as their hideout and headquarters while they went on a thieving and murdering rampage in Illinois. The first thing you'll want to do is to explore Cave-In-Rock itself. 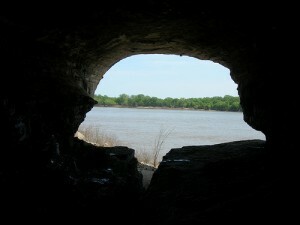 This 55 foot wide natural cave is located right on the shoreline of the Ohio River. You'll also want to explore the rest of the natural beauty of the park, including the high bluffs above the Cave that overlook the river, as well as some of the hiking trails that run along the river. At the mouth of Cave-In-Rock. Photo by Jimmy Emerson. Once you're done exploring by land, its time to explore by water! Hop on board the Shawnee Queen Tour boat out of Golconda Marina and take a three hour cruise on the Ohio River from Golconda to Cave-In-Rock. This is a great way to get a new perspective on the natural beauty of the area and get off your feet for a bit. Reservations can be made by calling (618) 683-5875. If you've got more time on your hands, hop in your car and take the Cave-In-Rock Ferry over to Kentucky at no cost and visit Amish Country about 2 miles south on Kentucky Highway 91. While you’re there, plan to stop in the quaint town of Marion, where you can do some antique shopping and grab a bite to eat. After you’re done shopping for antiques, visit the Ben E. Clement Mineral Museum, home to an outstanding collection of minerals, gemstones, carvings, period journals, photographs, mining tools and more. If you didn’t get enough adventure with the river pirates of Cave-In-Rock, you should also check out The Outlaw Trail while in Marion. It was once the treacherous road between Marion and Ford’s Ferry. Ford’s Ferry Road is now a scenic back road, but back in the day, Jesse and Frank James and the Cole Younger Gang were regular visitors to the area. If you don't want to wander over to Kentucky, or the Mineral Museum whetted your appetite, you can visit the Hardin County Flourspar Museum in Rosiclare, Illinois. Hardin County is known as the “Flourspar Capital of Illinois”. Flourspar is a mineral known for its beautiful colors, and as a catalyst in the production of steel. Of course, you're also right on the cusp of the eastern portion of the Shawnee National Forest. Other scenic spots in the area include Garden of the Gods, Pounds Hollow Recreational Area, Rim Rock Trails, and Tower Rock Recreational Area. Be sure to check out our guide to the Shawnee National Forest for a photo gallery and more things to do. Visitors can camp on the scenic north side of the park, which has 34 Class A sites with electricity. There are also 25 Class B/S tent sites. Showers, restrooms and dumping stations are present at both camps. Firewood and grills are furnished at each camp site. The Cave In & Rock State Park Lodge is a hunting lodge situated 80 feet above the Ohio River. They offer four duplex cabins for rent and guests and visitors can also eat at the aforementioned lodge, which is open seven days a week for breakfast, lunch and dinner. They’re located on the southern end of Illinois State Route One. (618) 289-4545. Historic Rose Hotel Bed & Breakfast. Photo by J. Stephen Conn. 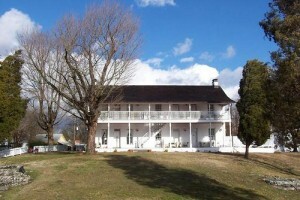 The historic Rose Hotel, in the Village of Elizabethtown, about 12 miles west of Cave-In-Rock, is a popular Bed & Breakfast. The “Rose” was opened in 1812 by the founter of Elizabethtown, James McFarland, and is the oldest hotel in Illinois. Be sure to check out Fort Massac and the Superhero of Metropolis, the next article in our Fall Outings in Southern Illinois series!